Move over Bollywood. Last night Priyanka Chopra became the first South Asian actress to win a People’s Choice Award in Los Angeles. She bagged ‘Favourite actress in a new series’ award for her lead role in the popular series Quantico. Dressed in a sequinned Vera Wang dress, she played it safe with an updo and finished her look with on-point smokey eyes. 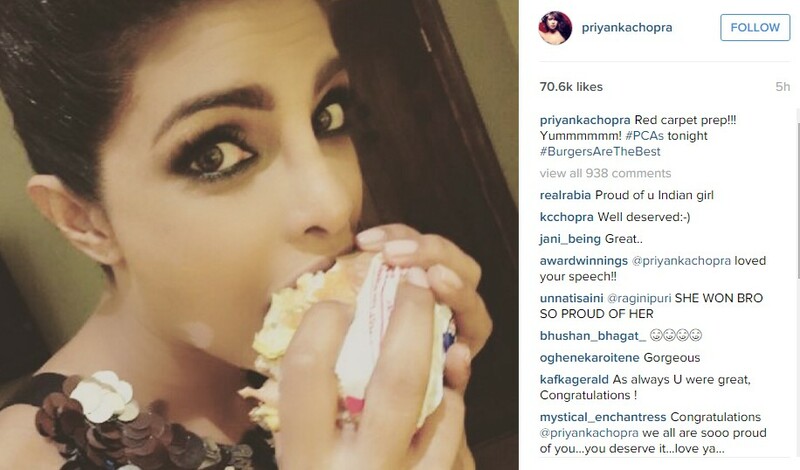 Just before hitting the red carpet she showed us that burgers are not all that bad! And finally, her undying spirit and heart-warming tweet to her fans is exactly why she made it to the cover of our Power Issue 2015 (read the cover story here).